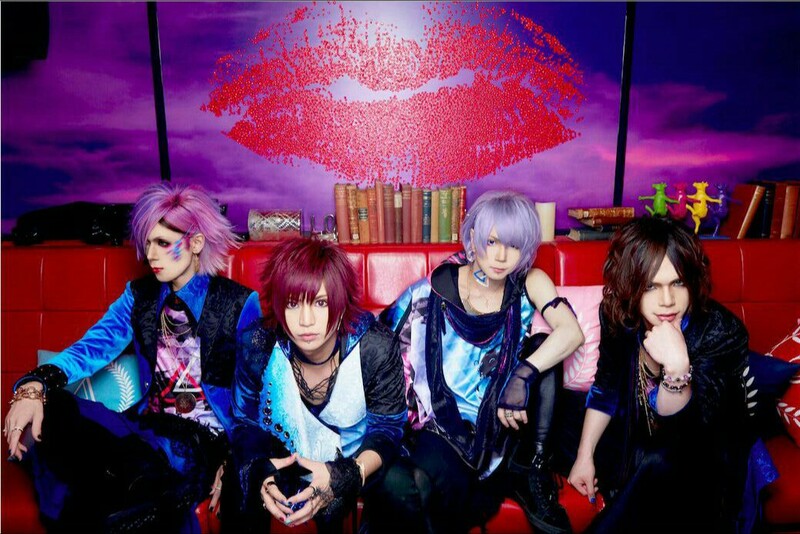 The ‘New Genre’ of Visual Kei, ViV, invited us to send a MESSAGE to their foreign fans at the opening of their event tour ‘Micha dame, mada dame, mou ii yo’ held at Shinjuku Ruido K4 on 12th October 2015. Could you tell me about ViV’s concept? Wataru: ViV’s concept is ‘abare-utamono’. [NB: ‘abare’ is a style of Visual Kei where fans move a lot during the set, moshing or doing a series of hand movements known as ‘furi’. ‘uta-mono’ is another style of Visual Kei where emphasis is placed on the melody and lyrics of songs rather than the scope for energetic furi.] Sometimes when bands are all about the ‘abare’ movement, the melody kind of disappears and we didn’t want that to happen so we also make the melody really important. We make it so that you properly have to move, using body and head, from start to finish, yet there is still a proper melody running through the song. What was the origin for the name ‘ViV’? Wataru: It comes from the English word ‘Vivacious’, and from the Italian musical term ‘Vivace’. [NB: a lively genre of music] Both terms start with ‘Viv’ so we took that concept and made it our name because when you listen to our bright songs, we want that bright feeling to accompany it as well. How did you come to join ViV? HIROHIRO: Well, my previous band finished and so did RayJi’s, so at that’s how we met, and then RayJi brought Wataru in. Then, we previously had a different drummer but when he quit, we invited Sayuki to join us. When you make your songs, what kind of themes or feelings do you aim to include? Wataru: Well, it differs on the song but recently our songs have become quite heart-rending. If you look at our set-lists you can see that we have those kind of songs a lot recently and within those songs we can include a lot of different emotions. We also look on the fans as a source of information and try to make songs that express what they feel and make them move. So with this ‘abare-utamono’ concept, we can’t stick to just one theme and have a lot of different ideas. So depending on the mood at the time and our changing view on the world, the songs themselves change. Do you make the lyrics or melody first? Wataru: Usually we start with the melody, but there are also times we start with the lyrics. We place priority on the melody so usually the melody produces lyrics that fit, but sometimes we have lyrics that call up a certain melody. What song do you want everyone to go and listen to? HIROHIRO: In ViV’s songs, I want everyone to go and listen to ‘MESSAGE’. It’s our first dialogue with fans where we say ‘Micha dame, mada dame’ and the fans say ‘mou ii yo’. [‘don’t look, you still can’t look’ ‘enough already!’], so it has a very new feel to it. We want to expand our world, so I want people to listen to it. RayJi: ‘Barenai you ni Kiss shite’ [‘So we’re not discovered, kiss me’]. It’s got great bass within it and a great amount of tension to it. Together we the fans we can make a clamour and enjoy it as one. Please listen to it! Sayuki: I also really like ‘Barenai you ni Kiss shite’ because I think it resounds a lot within the band-girl community and because we can really enjoy it together. RayJi: I really do love that song. HIROHIRO: Because of the bass? Rayji: It’s actually quite hard! Wataru: We have a very wide range of music and views on music, so from ballad to ‘abare’ music, but if it’s ballad music you like, I would recommend our 2nd single ‘Destiny’. If you listen to that, I think you can really understand ViV’s more ephemeral side, and I also want you to also listen to that more heart-broken side of us. On 7th October you released a new single called ‘MESSAGE’. Could you give us a brief explanation of the songs? HIROHIRO: Well, for the lyrics, Wataru wrote them and they became very busy songs. Even if you’re seeing ViV for the first time, I think you can really move to them. Wataru: Personally for me, when I was writing the lyrics for MESSAGE, I had something I wanted to convey to fans. If you have something you want to change, you can do it gradually under your own power, but I didn’t write it as literally or straight as that. If you just look at the lyrics once, you wonder what kind of lyrics they are. For example, I wrote the lyrics ‘micha dame, mada dame, mou ii yo’ and when you look at them you go ‘huh? This isn’t a love song?’ so what on earth is this? So you have to think about it by yourself and pull what you want or feel from it. And that is exactly the kind of message I wanted to convey. Thank-you very much. So let’s talk a little more about yourselves. What have you become interested in recently? Sayuki: Me first! As we head towards ViV’s big oneman live on 20th February 2016, I’ve started to do a twit-cast live stream every day. So I guess I’ve become interested in that. I can speak with the fan’s every day and get closer to them. RayJi: Recently I’ve been studying English and I use Instagram to help. On Instagram I’m trying hard to write all of my posts in English. I want to be able to expand my view of the world. Wataru: And now say it all in English. Or say something in English. RayJi: Uh… please follow me? HIROHIRO: I’ve been posting cover videos of various artists on Twitter so, please, if you have the chance, come and watch me. Wataru: This is an internet article right? For foreign fans? Well, if that’s the case, please, if you come to Japan, try IEKEI Ramen. There’s Tonkotsu-soup Ramen [NB: pork-bone broth ramen] and really delicious futomen noodles [NB: fat noodles]. It’s really the most delicious ramen in Japan. So if you come to Japan, please try and eat IEKEI Ramen. I recommend it. What does the word ‘music’ mean to you? Sayuki: Exactly the way it is written in kanji – ‘sound’ and ‘fun’. It’s making dreams real. Right now we can get CDs from the web or download music, but music is a concert thing. Fans and the band enjoy music together. So that’s what ‘music’ means to me. Wataru: Music is a temporal art form. There’s a word in English –‘time-out’. In times where there weren’t CDs or downloads, there was only the expression of music through performance. Then as a performer if we decide to give 100% on stage, a lot of the time it looks like only 80% to the audience. So if we give 120%, the audience see it as a full 100%. And if we give them that full 100%, then they can really move and create a prefect live atmosphere and enjoy it as much as possible. You can probably enjoy CDs alone but we’re a live band so when you hear us in the flesh, you can really feel our way of life through the music we play. And that is what ‘music’ means to me. HIROHIRO: Well, mine’s a little simpler but it’s a collection of hopes, dreams, myself and reality. RayJi: I really like this word – a four compound kanji. Kenzen Ichijo. [NB: the idea of the fusion of the heart and practice to make perfection or enlightenment in swordplay] It was a way of life by Miyamoto Musashi. He was a swordsman but music carries the same kind of concepts. You have to practice the sounds as well as expressing your own self. Just one or the other is not good enough. Sound is something that is always around you and always being addressed. It’s in the plants, the earth, the sky, it’s everything the world is. Whether you lend you ear to that or not is very momentous. Sound, and music, is something that always exists alongside us. All members: –laughter- that was deep! Do you have anywhere you want to go overseas? HIROHIRO: I’d like to go to England. Maybe London. And I want to go to Singapore! Really, really want to go to Singapore. Definitely really want to go to Singapore because there are fans waiting for us! Sayuki: I want to go to the Amazon. It’s not really a safe place so I want to go. HIROHIRO: What? Then why would you go? Sayuki: To see if I could survive. Sayuki: Well, actually, recently I’ve been into looking at survival things. Right now humans are really used to getting water and things really easily, but you can’t do that in the Amazon. There aren’t any umbrellas either so you have to protect yourself from the rain. I want to try going there once and experience that. What would I be like when I returned? Wataru: You’re very cautious with your skin care regime, but you’ll fry to a crisp in the sun! RayJi: I have loads of places I want to go. I want to see the world. I want to visit all of America’s states and go to Thailand, and Cambodia. I also want to go to the whole of Europe. But I still want to be in Japan. Yet I want to widen my world view, and show people my world, which is why I started Instagram. Even though I only have 66 followers. Wataru: 66! –laughs- Out of all the people in Japan. RayJi: I’d like it if people saw and wanted to come to Japan because of it. I really want to see the world though, especially Europe. The structures there are really cool. I want to play bass there. Maybe in England. Wataru: I love the sky, and the stars. I love blue skies and bright weather but I really want to see the Aurora. It’s one of my dreams because I think that if I could see it before my eyes, it would open up my mind. No, really, I’m very moved by watching the stars and the sky. There was one specific time where I was really blown away. It was after a typhoon and the clouds had parted in the really crimson sky. And in this diamond-shaped opening, there was like a form like a dragon rushing across the sky. When I saw it I thought ‘woah! What the heck is that?!’. I’m really moved by things that happen in a single moment like that. So something like the Aurora is really special. It’s like being at a live, it’s the feeling and creation of something within that single second. I really want to experience seeing the Aurora just for that very feeling. If you became a super hero, what power would you want? Sayuki: I want to be able to get rid of poverty. The power to help the poor. HIROHIRO: What? How? Like produce money from your hands and throw it at them? Sayuki: Whatever works. Just anything to help them. If I could get rid of poverty, wouldn’t that be a good thing? Wataru: I guess I’d be a hero that could save the world. For example, if a meteor was threatening the earth, I would jump for it and BAM! Save everyone. I would just patrol the earth, looking to save people. I think that would be amazing. HIROHIRO: I want to become God. HIROHIRO: I want to be able to decide how everything pans out. Wataru: Like if you wanted to spill someone’s miso soup, you could spill it. RayJi: I would become a really really tiny microorganism. Wataru: Is that a power? RayJi: Yeah, because I could go into the mouths of bad people and cause them to have a really bad cold. RayJi: But if I could do that… it’d be great. But! I love Doraemon so I also want his pocket. [NB: The character Doraemon can produce any number of useful items from his pocket]. Sayuki: A pocket like that would make people lazy. RayJi: I only said it because I didn’t want to aim as high as God. Compared to that, I don’t think I’m being unreasonable. Do you have a message for all your foreign fans? Wataru: At the moment we live in an internet society, so it’s easy to touch many people. Most of the time we probably reach people entirely by accident but because we’re trying so hard to circulate our music online and keep a presence there, if you’re able to see any of it, I’m really happy. Until you can come meet us, as long as you listen to our songs and enjoy us, then I’m content. We really want to go abroad but we are a Japanese band. So if you ever get the chance to come and see us, I would be ecstatic. HIROHIRO: Call us. Let us come abroad. I want to come abroad and see you, but, obviously, if you get the chance to come to Japan, I want you to see us. We want to come and see you but before we can do that, we need someone to call us to their country. RayJi: Music has no borders. I don’t really even care if there are borders. If we have music, you’re always next to me in my heart. ‘Please wait’ is written there. Sayuki: Visual Kei is part of Japanese culture. There’s lots of facets to Japanese culture, like anime, but the Visual Kei that people abroad think of is actually gradually changing. We’re not an old band, but even now Visual Kei is moving to a different place. So… please come with us. I think that you could call ViV a new genre of Visual Kei, and we want you to experience that change alongside us.